For other uses, see Portland Timbers (disambiguation). Soccer in Portland, Oregon can be traced to the soccer team that competed in the NASL as an expansion team until the club's seventh season in 1982. The club's major achievement was in their inaugural season during the league's playoffs, having won the league's division final, and runners-up in Soccer Bowl '75 losing to the Tampa Bay Rowdies in the championship match. In 1985, F.C. Portland had established and was a charter club in the Western Soccer Alliance League and competed until folding in 1990. There would be no soccer club in the city until 2001, when the USL Timbers was founded and competed in Division 2 soccer in USL pro till the club ceased operations in 2010. The USL pro club finished with the best record in the league in both the 2004 and 2009 regular seasons. The announcement of the Timbers' entry into MLS was the culmination of a nearly two-year-long process for Merritt Paulson, dating back at least to May 2007, when Paulson led a group that bought the Portland Beavers and the USL Timbers. The group included former Treasury Secretary Henry Paulson, Meritt Paulson's father. The biggest issue for the city of Portland at that time was that due to league concerns about seating configuration, field surface and scheduling, obtaining an MLS club would require a new stadium. In October 2007, Paulson was told PGE Park could be upgraded for about $20 million, and a new baseball stadium (with 8,000 to 9,000 seats) would cost about $30 million. By November 2008, Paulson told The New York Times he expected Portland taxpayers would spend $85 million to "build a new baseball stadium for his Beavers and renovate PGE Park—just remodeled in 2001 at a cost to taxpayers of $38.5 million—for soccer", and that in exchange, he would spend $40 million for the franchise fee to bring a new Major League Soccer team to Portland. MLS was in support of the proposal, wanting to continue to expand the number of owners in the league (for a while, all of its teams were owned by three men: Philip Anschutz, Lamar Hunt, and Robert Kraft). Though supporting the acquisition of an MLS franchise raised numerous issues for Mayor Sam Adams and the Portland City Council, the Timbers were announced as Major League Soccer's eighteenth team on March 20, 2009 by Commissioner Don Garber. The announcement occurred during the first and second-round games of the 2009 NCAA Men's Division I Basketball Tournament that were held in Portland. The announcement noted that the team would retain the Portland Timbers name. Former forward and Colorado Rapids assistant coach John Spencer was named the first head coach of the Timbers on August 10, 2010. It was also announced that former head coach Gavin Wilkinson of the USL-1/USSF D-2 Timbers, was promoted as the general manager/technical director of the team. The Timbers signed five players before the MLS Expansion Draft on November 24, 2010. Three were part of the Timbers D-2 Pro League squad in 2010 (Steve Cronin, Bright Dike, and Ryan Pore), one was signed from D-2 Pro League team Austin Aztex (forward Eddie Johnson) and one was acquired via trade with New York Red Bulls (midfielder Jeremy Hall). On November 24, 2010, the Timbers, along with the other 2011 expansion team, Vancouver Whitecaps FC, participated in an MLS Expansion Draft, each selecting 10 players from existing teams. Immediately after the Expansion Draft, the Timbers announced the trade of their first pick (midfielder Dax McCarty), from FC Dallas to D.C. United for defender Rodney Wallace. The Timbers and Whitecaps also participated in the 2011 MLS SuperDraft on January 13, 2011 with the Whitecaps having the first pick, and the Timbers having the second pick. Vancouver surprised some by selecting youngster Omar Salgado and Portland swiftly selected Akron midfielder/forward Darlington Nagbe. The Timbers played their first MLS game on March 19, 2011, against reigning MLS champions Colorado Rapids, but lost 3–1. The first goal in the Timbers' MLS era was scored by Kenny Cooper. In their first season, Portland Timbers finished in 6th place in the Western Conference and 12th place overall. On July 9, 2012, John Spencer was fired after a 0–3 loss to Real Salt Lake. Gavin Wilkinson took over on an interim basis for the rest of the season. The Timbers finished 2012 with the 3rd worst record in the league and was 8th out of 9th in the Western Conference. They did, however, win the Cascadia Cup in MLS for the first time. The 2013 season began with new Head Coach Caleb Porter, who was previously head coach of the United States U-23 team and the University of Akron Zips men's team from 2006 to 2012. Under Porter, the Timbers achieved immediate success in the 2013 MLS regular season. They finished in first place in the Western Conference and third place in MLS overall. An important player has been Diego Valeri, whom the Timbers had acquired from Club Atlético Lanús on loan with an option to purchase (which they exercised later in the season). In the 2013 Lamar Hunt U.S. Open Cup tournament, the club reached the semifinals, where they were eliminated by Real Salt Lake. The Timbers also earned their first MLS playoff appearance in franchise history. They defeated their archrival Seattle Sounders FC in the conference semifinals 5–3 on aggregate. The Timbers were eliminated in the conference finals, again losing to Real Salt Lake in a two–game aggregate series (5–2 aggregate). Due to a change by the United States Soccer Federation of how American-based MLS teams can qualify in the CONCACAF Champions League, the Portland Timbers qualified for the 2014–15 CONCACAF Champions League, which was their first international tournament they would later take part in. In the 2014 MLS season, the Timbers could not replicate the success they had in the previous season. They struggled defensively in the beginning of the season with a 1–3–6 (W-L-D) record over the first ten games. They were able to mount a comeback late in the season, still having a chance on the final weekend to appear in the MLS playoffs but ultimately failing to qualify. The Timbers finished the season in 6th place in the Western Conference, 11th place overall. For the 2014–15 CONCACAF Champions League, the Timbers were drawn with Club Deportivo Olimpia and Alpha United in the group stage of the tournament. They were eliminated in the group stage on away goals. During the offseason, Portland's main focus was to avoid a slow start as they did in the 2014 season, made more difficult with Diego Valeri and Will Johnson being unavailable for the first several weeks due to injuries suffered in the final games of the 2014 season. New acquisitions included Nat Borchers from Real Salt Lake and Ghanaian/Norwegian keeper Adam Larsen Kwarasey. The 2015 season marked the franchise's fifth anniversary as an MLS franchise and the fortieth anniversary of the Timbers' legacy that traces back to the original North American Soccer League, which has been recognized by the team. In 2015, the Timbers began their campaign without Diego Valeri and Will Johnson, who were still recovering from their injuries they obtained in the previous season. They would eventually return later in the season. The 2015 US Open Cup pitted Portland against arch-rival Seattle in the fourth round of the tournament, where they would eliminate the Sounders 3–1 in overtime, Seattle finished the match with only seven men after three players (which including Clint Dempsey) were given red cards, and Obafemi Martins leaving due to a groin injury. Portland would be defeated by Real Salt Lake in the fifth round. In a highly competitive Western Conference, the Timbers once again qualified for the MLS Playoffs, finishing strong in the final matches of the regular season which included a 5–2 win against LA Galaxy. Portland finished the regular season third in the Western Conference, fifth overall. Portland played against Sporting Kansas City in the MLS playoffs' Knockout round that went to penalties after Sporting's Kevin Ellis scored a late tying goal in the final minutes of regulation ending in 1–1. Maxi Urruti scored late in overtime tying 2–2 after Sporting had the lead from a goal from Kristen Nemeth in the 97th minute. Kwarasey scored the winning goal and made the winning save in the suspenseful penalties. The Timbers advanced to defeat Vancouver Whitecaps FC in the second leg of their two-game series, winning the Conference Semifinals 2–0. Portland defeated FC Dallas in the Conference Final series 5–3 aggregate with a 3–1 win at home and tying 2–2 in the second match in Toyota Park, becoming Western Conference Champions and advancing to their first-ever MLS Cup appearance. The Timbers won the 2015 MLS Cup against Columbus Crew SC 2–1 from the fastest MLS Cup goal from Diego Valeri, followed by a header from Rodney Wallace in the first half. Despite conceding a goal from Columbus striker Kei Kamara, the Portland Timbers held on to win their first MLS Cup and in doing so became the first team in the Cascadia rivalry to win the championship. Portland's 2016 offseason consisted of transfers of key players including Jorge Villafaña, Will Johnson, Maxi Urruti, and Rodney Wallace. For the Timbers' 2016 campaign as defending champions, the season began with a win in a rematch against Columbus Crew SC. Portland's season in 2016 overall was described by Head Coach Caleb Porter as "A tale of two seasons." Although the team had a strong record at home, that performance was not reflected on the road, and the team dealt with injuries to key players throughout the season. The Timbers did not win a single match away from Providence Park in the season, finishing with a road record of 0–11–6 away from home and 12–14–8 (44 points) overall. In 2017, the team made it a priority to improve the team's defense, an issue the previous year, along with adding reinforcements in the midfield. Portland acquired Roy Miller and David Guzmán from C.D. Saprissa. Nat Borchers, who was injured in 2016, was not offered a new contract with the Timbers, and ultimately the veteran defender decided to retire. The Timbers also signed Sebastián Blanco, who had been a teammate of Valeri at Lanús, from San Lorenzo. Mid-season the Timbers also acquired center-back Larrys Mabiala from the Turkish club Kayserispor. In the second half of the season, midfielder Valeri scored in nine consecutive games, setting a new MLS record. Portland qualified for the playoffs once more in their second-to-last match of the regular season, a 4–0 rout of D.C. United at Providence Park. The Timbers finished the season in first place in the Western Conference, also winning the Cascadia Cup for the second time as an MLS team. Portland were eliminated by the Houston Dynamo in the Western Conference Semifinal. For the first time a Timbers player received MLS's Landon Donovan MVP award, given to Valeri for scoring 20+ goals and earning 10+ assists, among other accomplishments; it was the most goals ever scored by a midfielder in MLS. In the off-season, Caleb Porter resigned as head coach on Nov. 16, 2017, parting ways with the franchise. On Dec. 18, the Timbers officially announced former New York Cosmos head coach Giovanni Savarese as the team's new head coach, making him the third non-interim head coach for the Timbers since entering MLS. Despite starting their 2018 season without a win in their first five games, Savaraese and the Timbers finished their campaign strong, and would earn their second trip to the MLS Cup on December 8, 2018, where they would be defeated 2–0 by Atlanta United. The Portland Timbers' MLS logo incorporates elements of the former USL design. The primary reference to the original crest is the circular shape that represents unity, wholeness, and the pursuit of perfection. The axe pays homage to the Pacific Northwest's logging industry, as loggers traditionally used axes to cut down trees. There are three chevrons organized to resemble a pine tree that refer to the Timbers' membership in three separate leagues: the original North American Soccer League, the United Soccer Leagues, and Major League Soccer. The team's colors, ponderosa green and moss green, represent the state of Oregon's forests. It was announced in September 2010 that the Portland Timbers' jerseys would be sponsored by Alaska Airlines. On Thursday December 9 the jersey was revealed at a runway show at Portland International Airport. The home jersey was a two-tone halved green shirt while the alternate jersey was red, in honor of Portland being known as the Rose City. However, before the start of the 2015 season it was announced that the club's uniforms had changed. The home jersey now features a yellow-green chevron displayed on the front. There also is a badge commemorating the 2015 season being the Timbers 5th MLS year and 40th existing year on the side of the sleeve. Home, away, and alternative uniforms. 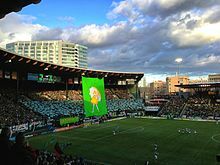 The Timbers play at Providence Park, which they share with the Portland State Vikings football team and, since 2013, Portland Thorns FC, a team in the National Women's Soccer League also owned by Peregrine Sports. The stadium's renovation in 2010–11 made it unsuitable for baseball, and former tenant the Portland Beavers moved to Tucson, Arizona, after failing to find a new venue. Initially, city funding for renovation of the stadium (then known as PGE Park) was tied to simultaneous construction of a new baseball ballpark; Timbers owner Merritt Paulson was the owner of the Beavers at the time. Due to delays caused by public criticism of potential ballpark sites and an impending deadline to begin stadium renovation, the funding for the two projects was separated. The capacity of the renovated stadium was expected to be between 22,000 and 23,000. Operational capacity was limited to 18,627 for the 2011 MLS season and expanded to 20,323 for the 2012 season. On February 10, 2014, the Timbers signed a long-term stadium naming rights sponsorship with Providence Health & Services, a non-profit health care provider. The stadium will be known as Providence Park until at least 2028. In December 2017, the Portland City Council approved for a $50 million expansion project to increase seating capacity for Providence Park. The project, whose terms were already approved in June of the same year, would add an additional 4,000 seats to the near 22,000 seats already built, increasing overall capacity by 20%. The expansion is set to be completed during the 2019 MLS season, and will be made available to attendees of both the Timbers and Thorns respectively. The Timbers have sold out every home game to date, with over 100 consecutive sellouts as of October 2016. The Timbers cap season-ticket sales at 15,300, and have a wait list of 10,000 season tickets; this is the largest in MLS, and larger than almost every college football team. The main supporters group of the Portland Timbers is the Timbers Army. Its members are known for their loud, enthusiastic support and the raucous atmosphere they create at Timbers games. The Timbers Army was founded in 2001 as the Cascade Rangers, a reference to the Cascade Range of mountains in the Pacific Northwest region of North America. The group began congregating in section 107 ("The Woodshed") of PGE Park ("The Piggy") to create a European-style rooting section for the club, complete with drumming, flags, scarves, smoke bombs and constant chanting and cheering. 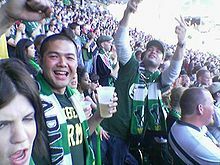 By 2002, the group had changed its name to the Timbers Army in order to lose any perception of partiality toward Scottish soccer club Rangers and because the Timbers uniforms at the time resembled those of Rangers rival Celtic. By 2012, the Timbers Army numbers more than 4,000 people in the north-end on game day. The Portland Timbers have continued a long-running rivalry with Seattle Sounders FC dating back to the original North American Soccer League. Reborn after Portland entered MLS as an expansion team, the Seattle-Portland rivalry rose to higher levels when they faced each other in the 2013 MLS playoffs in their two-game series where the Timbers eliminated their arch-rivals in their first-ever MLS postseason matchup. Vancouver Whitecaps FC, the other Cascadian USSF Division 2 Professional League team, was replaced by an MLS franchise in 2011. It competes along with Portland and Seattle in the Cascadia Cup. The three teams' historic rivalry dates back to the original North American Soccer League. During the NASL and USL years the team's mascot was a grizzled lumberjack named Timber Jim. On January 24, 2008, Jim announced his retirement. His final farewell was a game played against Puerto Rico Islanders on April 17, 2008, which the Timbers won 1–0. Timber Joey served as the unofficial mascot from then on, and was inaugurated as the new official mascot at an exhibition game vs Juventus Primavera on June 14, 2008, a game the Timbers won 1–0, and has served in that capacity ever since, leading into their MLS inauguration in 2011. Joey continues Jim's trademark of cutting a round (or "cookie") from a large log with a chainsaw every time the Timbers score a goal. This round is presented to the goal-scoring player after the game. If the team achieves a shutout (clean sheet), the goalkeeper also receives a round. Timber Joey has his own custom jersey with Portland-based outdoor tool manufacturer Leatherman as the shirt sponsor. Regular-season games not televised by Major League Soccer's national television partners are broadcast by Root Sports Northwest. Selected games are broadcast in English by Fox affiliate KPTV (channel 12) or its co-owned MyNetworkTV affiliate KPDX (channel 49) and in Spanish by Estrella TV affiliate KGW-DT3 (channel 8.3). Beginning in 2012, the team launched a regional syndication network, the Portland Timbers Broadcast Network, which provides the Timbers' over-the-air game coverage to additional markets. Partners of the network include the second digital subchannel of NBC affiliate KTVZ (channel 21.2) in Bend, Fox affiliate KEVU (channel 23) in Eugene and MyNetworkTV affiliate KFBI-LD (channel 48) in Medford. KPTV also airs a weekly highlight show, Timbers in 30, on Friday evenings. On the radio, all Timbers games are broadcast in English on KXL (750 AM, "The Game") and are simulcast in Spanish on both KWBY (940 AM, "La Pantera") and KSND (95.1 FM, "Recuerdo 95.1"). KXL also airs Talk Timbers, a weekly radio show dedicated to the team and soccer. For details on former players, see All-time Portland Timbers roster. Portland Timbers 2 (T2) is the farm club of the Portland Timbers. In October 2014, Merritt Paulson announced the creation of their USL Pro team, Portland Timbers 2 (T2). T2 began play in the 2015 USL pro season, having Merlo Field as their stadium to play for their home games. The purpose of T2 is to bridge a gap between the academies and the first level team, while having a better way to observe the players' progress and development as well. All regular-season home games since the Timbers' entry into MLS in 2011 have sold out, with the 100th such sell-out on September 10, 2016. Portland has qualified for the CONCACAF Champions League twice, the first in the 2014–2015 edition of the tournament. Scores and results list Portland's goal tally first. Bolded players are currently on the Portland Timbers roster. ^ Major League Soccer (MLS) franchise formed in 2009 but did not begin MLS play until 2011. Three previous incarnations of the club competed in the North American Soccer League (1975–1982), the Western Soccer League (1985–1990) and the USL First Division (2001–2010). ^ "Portland Timbers NASL Archives • Fun While It Lasted". Retrieved April 26, 2017. ^ "Timbers Soccer History". February 22, 2012. Retrieved October 19, 2017. ^ a b c Jaquiss, Nigel (November 26, 2008). "Paulson's Pitch". Willamette Week. Archived from the original on March 27, 2009. Retrieved March 21, 2009. ^ Gerald, Paul (October 31, 2007). "PDX's Ball Bearings". Willamette Week. Archived from the original on March 27, 2009. Retrieved March 21, 2009. ^ Jaquiss, Nigel (March 11, 2009). "Soccertown Or Suckertown". Willamette Week. Archived from the original on March 16, 2009. Retrieved March 21, 2009. ^ "MLS awarded the expansion berth to Portland". mlssoccer.com. March 20, 2009. Retrieved October 17, 2010. ^ "MLS awards team to Portland for 2011". Portland Timbers. March 20, 2009. Archived from the original on March 27, 2009. Retrieved March 20, 2009. ^ Houston Dynamo. "Timbers select John Spencer to coach MLS team in 2011". OregonLive.com. Retrieved December 3, 2011. ^ "Timbers Select 10 Players in 2010 Expansion Draft". Portland Timbers. November 24, 2010. Archived from the original on December 23, 2010. Retrieved November 24, 2010. ^ "Timbers Acquire DC United's Rodney Wallace for Dax McCarty". Portland Timbers. November 24, 2010. Archived from the original on November 12, 2013. Retrieved November 24, 2010. ^ Carlisle, Jeff (January 13, 2011). "2011 MLS SuperDraft winners, losers". ESPN. Retrieved January 27, 2011. ^ The Associated Press (July 9, 2012). "MLS Timbers fire coach John Spencer". Cbc.ca. Retrieved September 17, 2012. ^ "AP source: Timbers fire coach John Spencer - - SI.com". Sportsillustrated.cnn.com. July 9, 2012. Retrieved September 17, 2012. ^ HW Krieger (July 10, 2012). "Portland Timbers coach John Spencer fired, GM Gavin Wilkinson named interim head coach". Soccer Wire. Retrieved December 7, 2014. ^ MLS (2012). "Standings: 2012 Regular Season". MLSSoccer.com. Retrieved December 7, 2014. ^ Major League Soccer (December 13, 2013). "Portland Timbers headed to 2014–15 CONCACAF Champions League after USSF rule change approved". ^ The Oregonian (October 28, 2014). "Portland Timbers win in final weekend but fail to advance to 2014 playoffs". ^ "CONCACAF Champions League: Portland Timbers' "worst-case scenario" comes to life in elimination". MLSsoccer.com. Retrieved February 14, 2015. ^ "Real Salt Lake sends veteran defender Nat Borchers to Portland Timbers in exchange for allocation money". MLSsoccer.com. Retrieved February 14, 2015. ^ "Portland Timbers add Ghanaian goalkeeper Adam Larsen Kwarasey, will wait on Donovan Ricketts' fate". MLSsoccer.com. Retrieved February 14, 2015. ^ "5/40 Forty years ago today was the start of a new soccer team in Portland". MLSsoccercom\accessdate=March 14, 2016. ^ "Portland Timbers vs. Sporting Kansas City – MatchCenter". MLSsoccer.com MatchCenter. ^ "Portland Timbers head coach Caleb Porter sees club peaking at the right time". MLSsoccer.com. ^ "Columbus Crew SC vs. Portland Timbers – MatchCenter". MLSsoccer.com MatchCenter. ^ "Timbers lament "tale of two seasons" as playoff hopes hang on Decision Day". October 16, 2016. Retrieved October 19, 2017. ^ "Schedule". Retrieved October 19, 2017. ^ "Portland Timbers need dramatic defensive improvement to return to MLS playoffs - SBNation.com". www.sbnation.com. Retrieved October 19, 2017. ^ "Diego Valeri adds to his MLS-record streak of consecutive games with a goal". MLSsoccer.com. September 24, 2017. Retrieved December 13, 2017. ^ "Portland Timbers 4, DC United 0 | 2017 MLS Match Recap". MLSsoccer.com MatchCenter. Retrieved December 13, 2017. ^ "Portland Timbers' Diego Valeri wins 2017 Landon Donovan MLS MVP award". MLSsoccer.com. December 4, 2017. Retrieved December 13, 2017. ^ "Caleb Porter out as Portland Timbers head coach". OregonLive.com. November 17, 2017. Retrieved January 24, 2018. ^ "It's official: Portland Timbers name Giovanni Savarese new head coach". MLSsoccer.com. December 18, 2017. Retrieved December 18, 2017. ^ "ATL 2, POR 0: Five Stripes deliver MLS Cup glory". MLSsoccer.com. December 8, 2017. Retrieved December 15, 2018. ^ "Timbers Crest Story". Portland Timbers. Retrieved December 13, 2016. ^ "Timbers gain sponsor for jerseys". ESPN Soccernet. September 2, 2010. Retrieved September 3, 2010. ^ "2011 Portland Timbers Jersey". Football Shirts News. December 9, 2010. ^ "Timbers Unveil 2011 Jerseys". December 9, 2010. Archived from the original on July 15, 2011. ^ Leventhal, Josh (October 14, 2010). "Portland Beavers Plan Move To Tucson". Baseball America. Retrieved March 25, 2011. ^ Haberman, Margaret. "Vision for PGE Park: A place that says 'soccer'". The Oregonian. Retrieved February 17, 2011. ^ Straus, Brian. "Portland Timbers to change name of stadium to Providence Park". SI.com | Planet Fútbol. Sports Illustrated. Retrieved February 11, 2014. ^ Floum, Jessica (December 20, 2017). "Portland Timbers to move forward on Providence Park expansion". The Oregonian. Retrieved December 20, 2017. ^ "Building the Soccer Pyramid: How Sacramento Republic FC joined the MLS expansion conversation", MLSsoccer.com, Jonah Freedman, October 3, 2014. ^ a b Wahl, Grant (March 14, 2014). "2014 MLS Ambition Rankings: Toronto FC rises to No. 1 | Planet Futbol - SI.com". Soccer.si.com. Archived from the original on March 21, 2014. Retrieved April 22, 2014. ^ "Why College Football Is Studying Major League Soccer", Wall Street Journal, July 17, 2014. ^ Conover, Dan (July 18, 2008). "The Fun Five: Things to do and where to do them". The Post and Courier. Charleston, SC. Retrieved May 18, 2010. ^ Dure, Beau (August 25, 2009). "Portland Timbers show bark, bite as they prepare to join MLS". USA Today. McLean, VA. Retrieved May 18, 2010. ^ "Community Connection: Cascade Rangers". OregonLive.com. Archived from the original on May 9, 2001. Retrieved June 15, 2010. ^ "History". Timbers Army. Archived from the original on May 25, 2010. Retrieved June 15, 2010. ^ a b Wahl, Grant (May 23, 2011). "A Pacific Passion Play: Big-time clubs left Portland, Seattle and Vancouver 30 years ago, but their fans never did. Now the teams are back in MLS, and their reborn rivalries are turning the region into a hotbed of the sport". SI.com. Sports Illustrated. Retrieved June 11, 2011. ^ Andrews, Allison. "Who is Timber Jim?". SoccerCityUSA. Retrieved February 17, 2011. ^ "Timbers long-time icon, 'Timber Jim,' retires". Portlandtimbers.com. Retrieved December 3, 2011. ^ "Timbers introduce Joe Webber as new mascot". Portlandtimbers.com. Archived from the original on October 29, 2010. Retrieved December 3, 2011. ^ "Latest News". Portland Timbers. Archived from the original on October 29, 2010. Retrieved December 3, 2011. ^ "Broadcast Partners". Portland Timbers. Retrieved September 17, 2012. ^ "Timbers announce 2012 MLS schedule". Portland Timbers. January 5, 2012. Retrieved February 12, 2012. ^ "Players". timbers.com. Retrieved April 25, 2017. ^ a b "Who should be next on the Timbers' Ring of Honor?". Stumptown Footy, Michael Orr. Retrieved August 19, 2015. ^ The Oregonian: Photo of "Timber" Jim Serrill with caption. 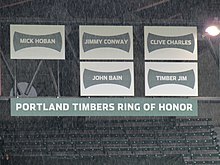 ^ "Mick Hoban inducted into Portland Timbers Ring of Honor". Portland Timbers. Retrieved August 24, 2015. ^ "Portland Timbers announce USL PRO team, T2". Portland Timbers. ^ "Quotes & Notes | Portland Timbers 1, Real Salt Lake 0 | Sep 10, 2016". Portland Timbers. September 10, 2016. Retrieved September 12, 2016. ^ "CONCACAF Profile". CONCACAF. Retrieved August 19, 2014. ^ "Portland Timbers vs. Alpha United". CONCACAF. Archived from the original on July 14, 2014. Retrieved August 19, 2014. 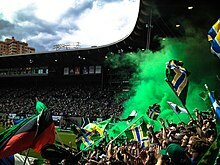 ^ "Portland Timbers vs. Alpha United". CONCACAF. Archived from the original on July 21, 2014. Retrieved August 19, 2014. ^ "Timbers vs. Olimpia". CONCACAF. Archived from the original on July 20, 2014. Retrieved August 19, 2014. ^ "Portland vs. Olimpia". CONCACAF. Archived from the original on July 20, 2014. Retrieved August 19, 2014. ^ "Timbers vs. CDD". CONCACAF. Archived from the original on July 25, 2016. Retrieved August 4, 2016. ^ "Portland Timbers beat CD Dragon 2–1: Watch Darlington Nagbe's game-winning goal". Retrieved April 26, 2017. ^ "Timbers vs. Saprissa". CONCACAF. Archived from the original on December 23, 2016. Retrieved January 21, 2017. ^ "Saprissa vs. Timbers". CONCACAF. Archived from the original on December 23, 2016. Retrieved January 21, 2017.